A porcelain laminate veneer is a thin layer of dental ceramic material that is fixed to the outer surface of a tooth with a special resin adhesive. 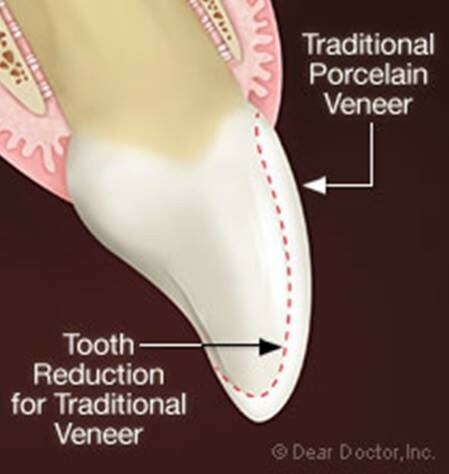 Veneers essentially replace tooth enamel. They enhance teeth cosmetically by masking a variety of minor to moderate dental imperfections. Working with dentists to pick an appropriate shade of porcelain, dental technicians can skillfully replicate natural enamel. Veneers do not stain the way teeth do, and can last seven to 20 years or even longer. That’s because porcelain is hard, strong, durable, translucent in an attractive, glass-like way, and highly resistant to chemical attack. If your dentist determines you are a good candidate for veneers, you can expect the process to take about two to three visits (including the initial consultation) over one to three weeks depending on whether the dental laboratory is in-house or not. The best way for your dentist to begin the process of designing your new smile is to create a model of your teeth, and then use it to make a provisional set of veneers out of plastic. You can actually wear these for up to two weeks to see if you like the effect. Once you and your dentist agree on the form and the shade of your veneers, specifications are sent to a dental laboratory. There, skilled technicians will mix porcelain powder with water, form it around a mold of your teeth, and bake it in an oven. Several layers are built up to mimic the translucency of real enamel.Before the veneer is bonded to the tooth, a small amount of the tooth’s surface — 1 mm or less — is usually removed in a process known as reduction. This often requires local anesthetic. There is, however, a relatively new procedure requiring no tooth reduction, referred to as the no-drill or prepless porcelain veneer. While veneers are most effective with minimal reduction (also called minimal prep), prepless veneers have the advantage of being reversible. But they are not appropriate in all situations. There is no substitute for your dentist’s talent and expertise in the various cosmetic techniques and materials. These skills — combined with a clear understanding of your goals and a diagnosis based on a thorough evaluation — are critical to assure the successful result of a beautiful smile. Porcelain veneers are strong enough to withstand normal flossing and brushing with any non-abrasive fluoride toothpaste; they should be cared for in the same manner as completely natural teeth. However, porcelain is a glass and like all glass, veneers can shatter if bent. Within reason, you can eat almost anything with veneers, but you wouldn’t want to crack nuts against them or chew on bones. And if you grind your teeth at night, you may need to wear a night guard to protect your veneers. This is an excerpt from original article. Is too much brushing in a day good or not? Remember, too much of anything is not good. More than three times brushing in a day may cause to remove enamel and make dental concerns in early future. At the start of every New Year, millions of Americans resolve to improve their health, with weight loss, exercise, and healthier eating habits topping many resolution lists. According to the Marist Institute for Public Opinion, weight loss was the No. 1 New Year’s resolution for Americans in both 2012 and 2013. Further, a 2011 study from the independent market research firm Market data Enterprises, “The U.S. Weight Loss & Diet Control Market,” showed that Americans spent nearly $61 billion on weight loss products in 2011. However, health professionals warn, many of these products fail to produce permanent weight loss or health benefits, and some of these diets and products actually may be harmful to a person’s health—including his or her oral health. Meal replacement drinks aren’t the only method that some Americans use to drop a few extra pounds. Many seeking to reduce calories often turn to diet soft drinks. Compared to regular, sugar-sweetened sodas, which contain about 140 calories per 12 ounces, zero-calorie diet drinks may seem like an attractive alternative. Unfortunately, carbonated drinks, whether sweetened with sugar or sugar substitutes, are often highly acidic (with a pH of approximately 2.7), which, dentists know, means that their chronic consumption can cause serious damage to oral health. What many people don’t know is that citric and phosphoric acids—which are used as flavor enhancers and preservatives in soda—can severely damage their teeth. All general dentists have patients who consume diet sodas, and many know that oral health problems arise when patients drink these acidic beverages all day long, effectively bathing the oral cavity in acid without a break. Inundated with sophisticated marketing campaigns, many people have eschewed soda in favor of energy and sports drinks—drinks they believe are healthier alternatives. According to the Jan. 29, 2013, report “Energy Drinks and Shots: U.S. Market Trends,” from Packaged Facts (a division of Market Research Group LLC), energy drinks are the fastest-growing segment of the beverage industry, with sales of more than $12.5 billion in 2012. They are especially popular among teenagers and young adults, who believe the drinks help them stay awake or perform better physically. Many add them to their diet when they start ambitious exercise regimens. Whether they are diet or sugar-sweetened, these drinks tend to be highly acidic. The oral health effects of some weight loss products and health trends may cause difficulty during diagnosis and treatment planning. For dentists, one of the principal challenges in treating erosion from these substances is early detection. As a complicated, multifactorial event, erosion can be difficult to detect visually, especially in its early stages, when changes may be subtle. Diet and its effects on dental health are a growing concern for dentists, many of whom have witnessed the destructive effects of popular diet fads and drinks on their patients’ teeth. If a dentist does learn that a patient’s diet includes highly acidic food or drinks, whether related to dieting products or not, the dentist can help that patient avoid serious problems by providing information and advice. Because a surprising number of patients are unaware of the dangers that acids pose to their teeth, telling them about these risks and suggesting alternatives, such as switching from diet soda to plain water, can go a long way to preventing damage and improving oral health. Further, general dentists who are educated about these various diet methods and products will have a better idea of what their patients are actually consuming.